Gum disease in Bonita Springs doesn’t just affect patients that are less than great at maintaining good oral hygiene habits. It’s very easy to get gum disease no matter what age you are or habits you have. Many factors may play into it, even your genetic makeup. There are many patients that visit our Pelican Landing Dental office expecting a clean bill of health to discover that they have gum disease. You don’t have to fret. Although being diagnosed with gum disease isn’t ideal for any patient, our dental professionals have the treatments you need to get your oral health back on track. 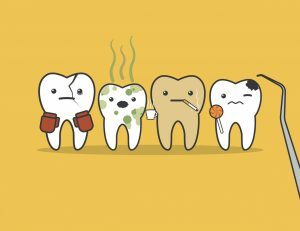 Although teeth are meant to last a lifetime, many people lose them due to periodontal disease (advanced gum disease). In most cases, it’s because patients are unaware they could have been taking action to prevent losing their teeth. It’s as simple as visiting their dentist for assistance when they first notice signs of unhealthy gums. If you notice these signs of gum disease, visit Pelican Landing Dental for revitalizing periodontal therapy in Bonita Springs to re-stabilize your smile. If you neglect your teeth and gums for too long, your smile could eventually become infected with gum disease’s evil twin: periodontal disease. When this happens, your gums will start to recede and form small pockets for plaque to become trapped in. You won’t be able to remove this dental debris by simply brushing and flossing. Our dental experts will need to intervene for the betterment of your oral health. Without visiting our dental office, you will be on the fast track to jaw bone deterioration and tooth loss. Luckily, our office offers periodontal therapy to correct settled gum disease. Along with antibiotics to eliminate harmful bacteria, your dentist will complete two complimentary procedures: scaling and root planing. Dental scaling is a nonsurgical way to treat advanced gum disease. By utilizing a dental instrument, your dentist will manually remove the harmful plaque from between your teeth, along with your infected gum line, and from the infected gum tissue pockets. Some cases call for the infected gum tissue to be removed altogether if they are extremely inflamed. Dental root planing makes it easier for healthier gums to grow and reattach to your teeth. Your dentist will finish the periodontal therapy session by smoothing the surfaces of your tooth roots. Root planing also prevents further infection down the road. It’s best to reduce your chances of developing gum disease by practicing good dental habits now. That means brushing and flossing as directed by your dentist and keeping all your regular dental appointments. But, if you are unsure about the health of your gums contact our Bonita Springs office. Pelican Landing Dental offers effective, thorough periodontal therapy that truly works. With our non-surgical treatments, we can give you comfortable dental care to keep your smile as healthy as possible.